International Journal of Research in Health Sciences,2014,2,4,947-952. 1-Associate Professor, 3-Senior Instructor. 5-Professor, School of Public Health and Community Medicine, BP Koirala Institute of Health Sciences, Dharan, Nepal. 2-Associate Professor, Dept. of Gynecology, BPKIHS, Dharan, Nepal. 4- MSc student, Dept. of Microbiology, Sunsari Technical College PVT. LTD, Dharan, NEPAL. Background: South Asia has a large proportion of young people in the world and teenage pregnancy has emerged as one of the major public health problem among them and bearing serious social and medical implications relating to maternal and child health. Objectives: To find out the incidence of teenage pregnancy and its impact on birth outcome. Methods: A cross-sectional study was conducted among the residents of Rangeli Village Development Committees (VDC) in the Morang District with 300 households as respondents. Semi-structured questionnaire was used and face to face interview was conducted for data collection. Chi-square test was applied to find out the association between sociodemographic characteristics and outcome variable for birth outcome and age first pregnancy. Results: About 61.7% of respondents were pregnant before 19 years of age. 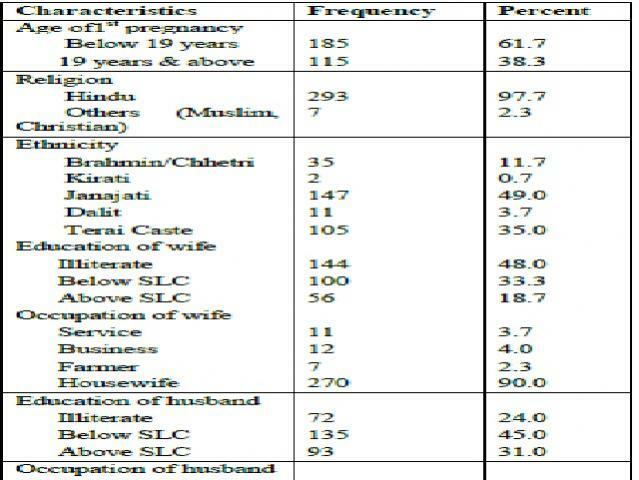 Women belonging marginalized community (Dalit and Janajati) was more likely to have teenage pregnancy compared to women with other ethnic groups (P<0.001).The women with SLC and higher education was less likely to have teenage pregnancy (21.4%) compared to women with below SLC (60%) and illiterate (78.5%). Furthermore, economic variable shows stronger association with teenage pregnancies (p<0.001). Fetal complication was significantly higher among teenage pregnancy (80%) than women with 19 years and above (20%). The proportion of low birth weight (<2.5 kg) babies was also significantly higher in women with teenage pregnancy (80%) than women with 19 years and above (20%). Conclusion: Teenage pregnancy is still a rampant and important public health problem in Nepal with unfavorable neonatal outcome and needs to be tackled on a priority basis.